Start saving water & tame your toilet with a Toilet Tummy Bag.WC water saving product that’s effective, low in cost, maintenance free and user friendly. Invented 20 years ago, millions have been sold and remain in successful operation saving water every day. The Toilet Tummy™ is the least complex and easiest to use toilet tank water saving product; just fill with water and hang on the inside of the toilet tank wall then forget about it… Saves an approximate 2 to 3 Litres of water per flush depending upon whether one or two are used. The Toilet Tummy™ is lightweight, and never needs maintenance. With the average person flushing a minimum of six times a day the Toilet Tummy’s™ water savings add up . 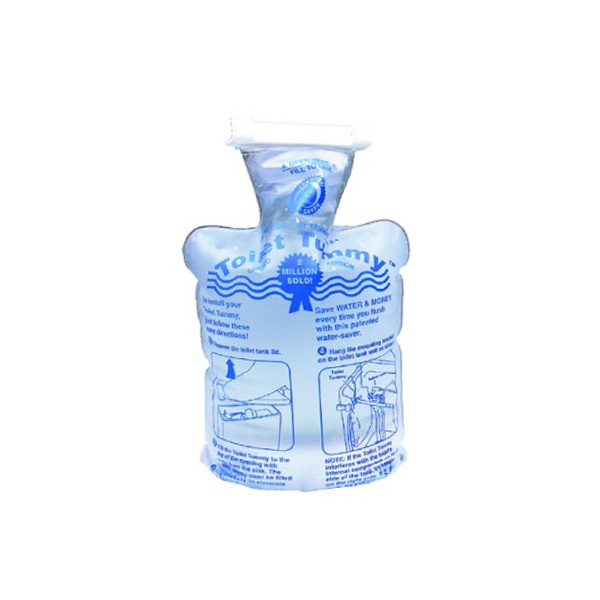 Water Saving Toilet Tummy bags weigh 54 grams, don’t corrode, and have a heavy duty pinhole free PVC construction. Valve is self sealing and anti-evaporative.